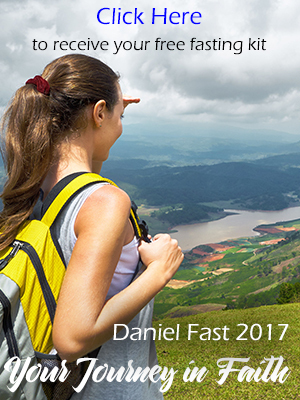 The Daniel Fast is based on the fasting experiences of the prophet Daniel from the Old Testament in the Bible. It’s a partial fast where a group of foods are restricted for a spiritual purpose. The Daniel Fast affords people a powerful time to focus special attention toward their God and His Word – the Holy Bible. Since 2007, this blog has served thousands of men, women and teens who enter the Daniel Fast to draw closer to God, pray for specific purposes or to study the Bible and learn God’s ways. My prayer is that you will spend some time on the blog and also visit http://Daniel-Fast.com and learn about the fast. You will find a caring and warm community here – and you can join our mailing list by going to http://Daniel-Fast.com to receive complimentary information about the fast, Bible study messages and devotions. Be blessed as you continue to grow in the love and knowledge of Jesus Christ. When I am having trouble with my focus or hearing from God (and we all do at times), I double up on my time in the word (and I read the word outloud). I encourage you to study all scripture that refers to “Who you are in Christ!”, “In Him”, “Through Him”: Look up scriptures about the spirit of man (the born again inner man that is made in God’s image and in His likeness and is made to live eternally with Him, soul (mind, will and emotions, flesh) and body (physical body, also flesh).